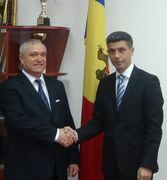 On 8 April 2015 in the Ministry of the Economy of the Republic of Moldova, Chisinau, Mr. Mircea Ciopraga, Secretary General of the PS IGC TRACECA met with Mr. Stephane Bride, Chairman of the TRACECA National Commission, Vice Prime Minister and Minister of Economy of the Republic of Moldova, Mr. Vasile Botnari, Minister of Transport and Road Infrastructure of the Republic of Moldova, and Mr. Octavian Calmic, deputy minister of economy. Within the discussions on the latest developments of the TRACECA participants of the meeting exchanged views on the problems and priority issues, strategic and integration prospects of the whole Europe-Caucasus-Asia region. One of the main points of the agenda of the meeting was the current legal status of TRACECA and its further transformation to the international organization. Mr. Bride assured Mr. Ciopraga in the legal support and assistance on the all stages of transformation. 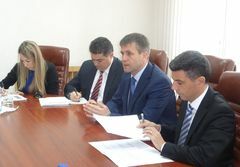 The Parties mentioned the issues of further attraction of the investments projects and its significance for TRACECA, institutional strengthening in the context of development of the international transport corridor "Europe-Caucasus-Asia". 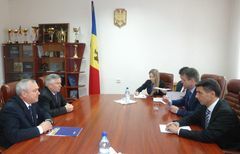 Mr. Mircea Ciopraga, Secretary General of the PS IGC TRACECA underlined the necessity of the active involvement of all 13 TRACECA member-states as well as state structures of the MLA TRACECA member in the implementing goals and objectives of the Strategy for Development of TRACECA till the end 2015, and the subsequent development of the Strategy of the IGC TRACECA for the period up to 2025. Mr. Ciopraga informed Mr. Bride on the results of meetings with representatives of the ongoing EU-TRACECA projects and future plans of the Permanent Secretariat in view of the need to improve the effectiveness of ongoing and upcoming projects in the future. On the outcomes of the meeting the Parties expressed mutual desire for further close cooperation.